The event was jointly organised with the Belarusian Helsinki Committee, the Christian Social Service and the Belarusian Association of Journalists. Over 80 people attended the conference including experts from Belarus, Russia, Ukraine and Poland, as well as government representatives, diplomats, lawyers, and human rights defenders. 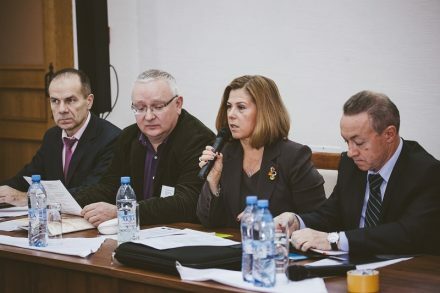 This conference was held under a PRI project funded by the European Union to campaign for the abolition of the death penalty in Belarus. Belarus is the only country left in the European region to still carry out the death penalty. A key aim of the project is to increase public awareness about the use of the death penalty (a surprising number of members of the public surveyed as part of the project did not know that Belarus continues to execute people, for example), as states that retain the death penalty often justify retention on the strength of public opinion. Two large public surveys have been carried out as part of the project – one in 2013 and the second this year, launched on World Day Against the Death Penalty on 10 October. Findings from the second survey were presented at the conference. The results are encouraging with 41.9% of respondents saying they wanted to keep capital punishment as it is or to widen its scope, compared to 46% who said this last year. A key activity of the project was to strengthen and revitalise media coverage of the death penalty and a variety of workshops and trainings for journalists have been conducted. Close cooperation and advocacy with the media has also produced good coverage of the issue over the course of the project. This work was presented to the audience by a representative of the Belarusian Association of Journalists. The project also held a journalism competition and three journalists, including 26-year-old Adaria Gushtyn, who also won the Russian language category of PRI’s first international competition for investigate journalism on the death penalty, were presented with their awards. Project activities have also included awareness raising activities with a range of different social groups – teachers, students, youth groups, lawyers – through focus groups, public discussions and cultural events. Project partner, the Belarusian Helsinki Committee, presented the results of this work and a map for future reform based on their findings. The plenary session was led by a judge in the Constitutional Court of Belarus, Stanislav Danilyuk, who said that the possibility of an irreparable miscarriage of justice is one of his biggest concerns about the continuing use of the death penalty. He was joined by former Prosecutor General and Professor of Constitutional Law, Grigory Vasilevich, who spoke about the importance of proportionality in criminal law, and by a representative of the a human rights group in Ukraine who spoke about the challenges Ukraine faced when it abolished the death penalty. Belarusian public opinion on crime and punishment, including the death penalty, 2013 (report) English/Russian.